So maybe seeing raw vegan nachos on Greenwave’s menu stuck with me, or maybe it’s just that I really love nachos… either way, I had raw vegan nachos on the brain. After reading a few recipes for sauces, I figured I had some pretty good ideas of my own to try, and took to the Vitamix. I think the secret to this sauce is really the smoked paprika. A nod to what makes Bang, Bang Cafe in Seattle’s vegan mac so good. I put a bit more turmeric, smoked paprika and cayenne than what’s listed below, but that’s a good place to start, and then you can customize it to your palette. I really love the flexibility and creativity I’m feeling with raw food. It’s great to have so many fresh ingredients on hand and just use what I’m in the mood for, or what needs to be used up. For the nachos, I cut up the last three pieces of raw onion bread I picked up Saturday at Greenwave. They were starting to get crispy from sitting in the fridge, so they really worked well. For toppings I used the last of some romaine I had, a big handful of chopped cilantro, a seeded, chopped tomato, and a few sliced kalamata olives. 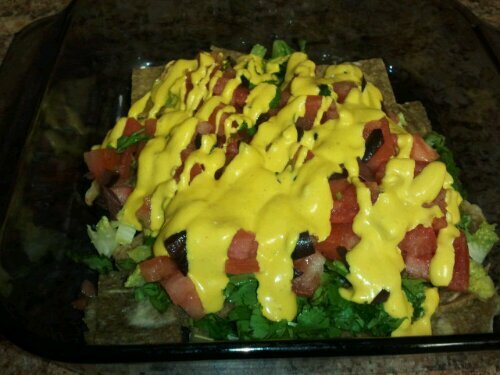 Then I drizzled it all with this raw vegan nacho cheese sauce. I didn’t use any additional water because I liked the thick consistency, so I started with about 1.5 cups worth, and used about 1/2 cup of it. I saved the rest for another use. 1. Put dry cashews in a high powered blender or food processor and chop until they’re a fine powder. 2. Add all other ingredients, and blend until smooth. Adjust seasonings and thin with additional water as desired. If using a vitamix, you can blend a bit longer to warm mixture a bit. I just held the carafe to monitor the temp. Brilliant! I love nachos (perhaps too much) and have looking for a good sauce. Definitely making this for my next nacho day. Thanks for sharing! Yay! I’m going to make this sauce this weekend! I might try making some raw chips in the dehydrator to go with it, or maybe just on regular chips. Also, this would make an excellent dressing for kale chips!! You have a dehydrator? Which one? i have the excalibur 9 tray. its humongous but i love it. Do you use it a lot? And for what?